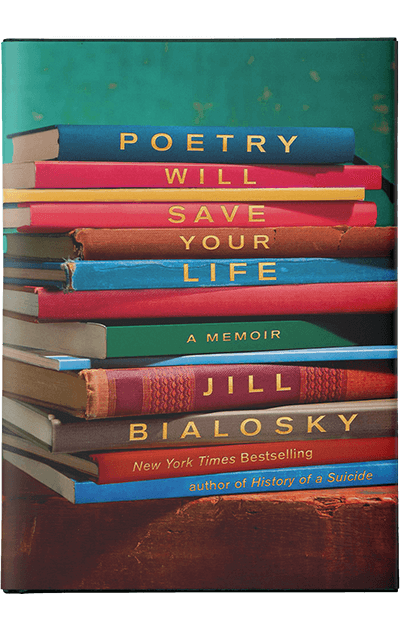 Jill Bialosky has written a memoir concealed within an anthology of poems. The world is crowded with memoirs, which universities sometimes insist on calling “life-writing,” a term so unlovely that writers have stabbed themselves with a pen rather than use it. The idea of using poetry in service of autobiography is an old one—Dante’s La Vita Nuova is the best known of medieval prosimetrum works; but in the wake of Rousseau the Romantics had a taste for leaving behind—in prose, poetry, or both—a private record of poetic life. Coleridge’s Biographia Literaria and Wordsworth’s The Prelude are not the only access to those complicated men, but their force and intuition make them indispensable to each poet’s version of poetic evolution. Poets are formed by poems, just as Lego sculptures are formed of, well, Lego. You get some insight into Shakespeare’s mind from Shakespeare’s borrowings; but it would be far better to have a manuscript in which he remarked on the poems he blamed for his growth and development. Occasionally a poet will refer in an interview to one poem or another crucial to his nascent imagination, but we have few documents that do so in depth. Some revelations might be slightly embarrassing, because not all sources are worthy of their heirs—Dickinson, for example, loved more than her share of trashy poems. We would be richer had Eliot, or Lowell, or Bishop compiled such an anthology, leaving a portrait of the “growth of a poet’s mind,” as Pound did in ABC of Reading. Bialosky tells how her life has been touched by various poems, arranging incidents more or less chronologically, more or less by theme (Danger, Shame, Sexuality, Friendship). The themes have been bolted on, more marketing than memoir; but the real problem is that this book intended for adults has been written in a style that would embarrass a child of twelve. The editor of W. W. Norton’s distinguished poetry list writes as clumsily as a new-born calf. One day, a new girl moves into the house behind mine. I’ll call her Marie. She has blond hair and dark-brown, sensitive eyes. . . . In the winter we huddle in her bedroom or mine and play with our Barbie dolls, imitating the seductive world of adults. Sometimes we go into the clubhouse behind her house and show each other our flat chests[,] wondering when we’ll get bumps. All of us who were in New York City will remember the glaringly perfect blue skies of that day, so incongruous with the terrorists’ act, and the overall atmosphere of disbelief as the vibrant city mourned the thousands of loved ones lost, and Americans stood frozen in front of their television sets trying to comprehend the improbable act of destruction while somewhere the executioners sang. The tone deafness of her prose is almost as wearying as the gush of clichés. Bialosky has chosen some fifty poems, most by Americans, most from the twentieth century. A lot of the usual suspects are here, but it would be odd if a lot were not. Her choices are sometimes peculiar, as should be true of any good anthology: Keats and Wordsworth, not Coleridge; Dickinson, not Whitman; Frost and Stevens, not Eliot, Pound, Moore, or Williams. Instead, there are Robert Louis Stevenson, Louise Bogan, Gerald Stern, and Li-Young Lee. There’s no living poet younger than sixty; but this is, after all, a private anthology—poets can scarcely help which poems invented them. The deeper problem is that Bialosky is uncomfortable with what poems are, if they are anything but simpleminded—she wants poems to console the reader or offer rude guidelines for living. (That’s the point of the title.) Can she really believe that most problems with the young could be solved if “We Real Cool,” a “cautionary tale,” were “taped on the refrigerator of every house with a teenager”? “Poems,” she declares, on her way to a panacea, “are a form of mythmaking, as they seek to create a unified vision of cosmic, social, and primal life order.” Primal life order? I’m not sure what the heck that is, but I very much hope that isn’t the point of poetry. I allow its seductive voice to take me to the enchantments of the unknown world where father, legacy, and prayer are all intertwined. Surely this is one of the reasons poetry enriches us. A poem links us to a universe at once intimate and communal. Reading this, I feel I’ve been imprisoned in a poetry theme-park. Most of the memoir is a bland coming-of-age tale, no different from a hundred others except that it’s duller than most, no different except that it has been written in a debilitating present tense. Still, some of the incidents reveal a subtlety of feeling the prose refuses to explore: the lost dog never found, the expensive sweater Bialosky can’t bring herself to wear, the college that goes bankrupt after her freshman year, and the inconsolable loss of two babies. Unfortunately, prose is an unforgiving master—it can reveal depths unseen and shallows better concealed. Instead of an intimate sense of the little that poems can do at the worst of times, chapter after chapter offers a sales pitch. Bialosky jabbers about (re: Stevens’s “The Snow Man”) the “iconic association of building a snowman as a child,” informing us (ditto) that the “poem unites us. We are all essentially alone, and yet also part of a larger humanity,” confiding (re: Robert Frost) that “I am privy to the tough pulse of another being’s consciousness” or (re: Emily Dickinson) “I let the dark undercurrent of loss pulsate in my own life and unleash a well of sorrow.” Unleash a well? The innocent reader might be forgiven for never picking up a poem again. When she says, of Sylvia Plath and Ted Hughes, that “they birthed two children and numerous collections of poems,” I almost choked to death with laughter. Bialosky is on no more certain ground with poetics, declaring that a “sonnet is a fourteen-line poem that rhymes in a particular pattern.” Quite a few different patterns are common in sonnets, but to leave out iambic pentameter is to leave out much that makes a sonnet a sonnet. A villanelle, to her, is a “verse poem with a particular rhyme scheme that repeats certain end words, assigning it complex musicality. Its power is restraint. The rhyme sequence allows for its song-like quality and its surface fun.” Assigning it? Surface fun? Her definition is so vague and silly a reader couldn’t recognize a villanelle in broad daylight. Memoirs no more require a raison d’etre than the writer’s desire, or neediness. Still, it’s hard to imagine Bialosky’s intended audience. Her past offers little beyond the experience of Everyman, and many of the poems will already be familiar to anyone who suffered through high-school English. Most poets will know half a dozen or a dozen by heart: “Bright Star! would I were steadfast as thou art,” “After great pain, a formal feeling comes,” “The Road Not Taken,” “Stopping by Woods on a Snowy Evening,” “Musée des Beaux Arts,” “My Papa’s Waltz.” The publisher apparently couldn’t afford a copy editor, so niggling errors have wriggled in—the scene setting for Gwendolyn Brooks’s “We Real Cool” (“The Pool Players. / Seven at the Golden Shovel”) is printed as if it were the first stanza; a character given a pseudonym is now Mary, now Marie; Rilke was born in 1875, not 1874, and Adrienne Rich in 1929, not 1950; Paul Laurence Dunbar’s middle name is spelled “Lawrence” in a chapter heading; and Bialosky says that Plath’s “Nick and the Candlestick” ends, “The pain / You wake to is not yours.” Her statement lies just beneath the four stanzas that follow that line. Bialosky’s naive, dispiriting book shows throughout that, despite her love of poetry, one of the most important editors of contemporary verse has a narrow comprehension of her art, not just in her love of the rankly sentimental, but in her failure to include many poems the least challenging. Worse, she has plagiarized numerous passages from Wikipedia and the websites of the Academy of American Poets and the Poetry Foundation. Her borrowings are highlighted in bold. Born on November 13, 1850, in Edinburgh, Scotland, Robert Louis Balfour Stevenson came from a long line of prominent lighthouse engineers. During his boyhood, he spent holidays with his maternal grandfather. . . . Prone to illness, Stevenson spent many of his early winters in bed, entertained only by . . . love of reading, especially William Shakespeare . . . and The Arabian Nights. Robert Louis Stevenson was born in Edinburgh, Scotland, on November 13, 1850. He came from a family of lighthouse engineers. During his boyhood he was prone to illness and spent many of his childhood winters in bed, entertained by reading Shakespeare and The Arabian Nights. She attended Mount Holyoke Female Seminary . . . , but only for one year. Throughout her life, she seldom left her home and visitors were few. The people with whom she did come in contact, however, had an enormous impact on her poetry. She was particularly stirred by the Reverend Charles Wadsworth, whom she first met on a trip to Philadelphia. He left for the West Coast shortly after a visit to her home in 1860, and some critics believe his departure gave rise to the heartsick flow of verse from Dickinson in the years that followed. . . . By the 1860s, Dickinson lived in almost complete isolation from the outside world. After attending Mount Holyoke College for a year, she barely left her home and had few acquaintances. . . .Those she held close had an enormous impact on her verse. One such figure was Reverend Charles Wadsworth, whom she met on a trip to Philadelphia. He left for the West Coast shortly after a visit to her home in 1860, and some critics believe his departure unleashed the wistful, at times heartsick, always profound flow of verse in the years that followed. From that time, Dickinson lived in almost total isolation from the outside world. She repeats the Academy’s error of “shortly after”—Wadsworth left for San Francisco more than two years after the visit. Many of Bialosky’s changes here and elsewhere—“barely” for “seldom,” “verse” for “poetry,” “unleashed” for “gave rise to,” “total” for “complete”—are the slight, guilty revisions of the serial plagiarist. “Mount Holyoke College” is simply a mistake. The school, as the Academy site correctly says, was then called Mount Holyoke Female Seminary. Paul Laurence Dunbar was one of the first African American poets to gain national recognition. His parents . . . were freed slaves from Kentucky. . . . Dunbar had poems published in the Dayton Herald. While in high school he edited the Dayton Tattler. . . . Dunbar was financially unable to attend college and took a job as an elevator operator. . . . Dunbar moved to Chicago, hoping to find work at the first World’s Fair. He befriended Frederick Douglass, who found him a job as a clerk, and also arranged for him to read a selection of his poems. Paul Dunbar was one of the first African American poets to gain wide recognition. His parents were freed slaves from Kentucky. . . . In high school, he published his poems in the Dayton Herald but he did not have money to attend college and took a job as an elevator operator. He eventually moved to Chicago in hopes of getting a job at the World’s Fair, and there he befriended Frederick Douglass, who found him a job as a clerk and arranged for him to read from his poetry. Her poetry is noted for its technical precision . . . and insight into . . . family relationships. Glück . . . is known for her technical precision and sharp insights into family relationships. Although Lowell’s manic depression was often a great burden (for himself and his family), the subject of that mental illness led to some of his most important poetry, particularly as it manifested itself in his book Life Studies. When he was fifty, Lowell began taking lithium to treat his mental illness. Although Lowell’s manic depression was a great burden for him and his family, the exploration of mental illness in his verse led to some of his most important poetry, particularly as it manifested itself in Life Studies. When he was fifty, Lowell began taking lithium to treat his mental illness. “Child is father of the man” is an idiom originating from the poem “My Heart Leaps Up” by William Wordsworth. “The child is father of the man” is an idiom originating from the poem “My Heart Leaps Up” by William Wordsworth. A term originally coined by poets Jerome Rothenberg and Robert Kelly. . . . The idea was later redeveloped by the poet Robert Bly, and deep image became associated with a group of midcentury American poets including . . . James Wright. . . . , focusing on allowing concrete images and experiences to generate poetic meaning. A literary term originally coined by poets Robert Kelly and Jerome Rothenberg and redeveloped . . . by Robert Bly, James Wright, and other midcentury American poets. It is a poetic technique that allows concrete elements and experiences . . . to generate poetic meaning. Plath, under a wintry dawn sky . . . , finds herself on a street where poppies are for sale and where businessmen wearing bowler hats are walking by while an ambulance hurtles past, carrying a hemorrhaging woman. Under a wintery sky, she finds herself on a street where poppies are for sale and businessmen wearing bowler hats and an ambulance carrying a bleeding woman pass by. This last malfeasance is made worse because Bialosky quotes from Vendler’s book just before stealing her prose. There are other passages almost as damning, but these are damning enough. WILLIAM LOGAN's most recent book of poetry, Rift of Light, is now available from Penguin. His book of long essays on familiar poems, Dickinson's Nerves, Frost's Woods, will be published by Columbia University Press next April.